Discussion in 'Thumpers' started by Tseta, Jan 20, 2011. 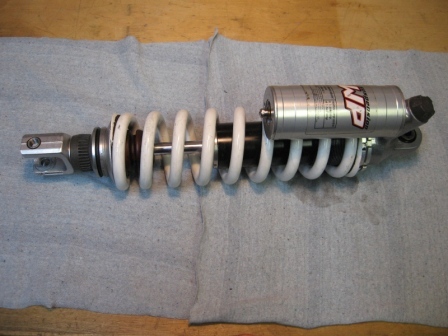 This shock absorber is found on many KTM LC4-based enduro, adventure and supermoto motorcycles (some Duke-models as well?). The internals may be a bit different for each version, but the basics should be the same across the board. 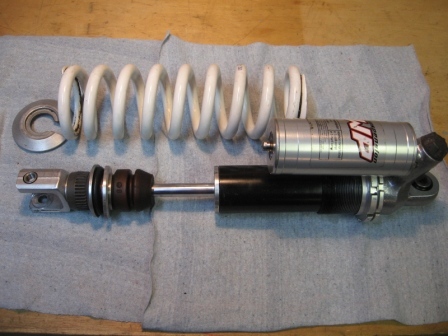 This post shows one method of servicing the shock. Do note that what has worked for me may not work for you. This post is really not meant to be a &#8220;how-to&#8221;, rather it is supposed to inspire others to try it for themselves. 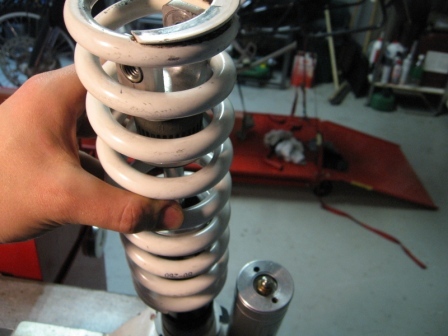 The WP factory manual for this shock is available, and this post is surely not meant to replace that. I recommend using professional shock service for the best results. However, if you feel inclined to service the shock yourself, I recommend that you acquire the relevant service manual for your shock and follow the instructions there for servicing your shock. Nevertheless, I found that the WP manual can be quite vague on many points. Also, it assumes you have the full official special tool set &#8211; which most of us don&#8217;t. In addition, the manual goes quite unnecessarily far on the disassembly, and includes no comments on which are the &#8220;true&#8221; wearing parts. The philosophy seems to be &#8220;replace everything&#8221;. There are many knowledgeable suspension tuners around, who will surely be able service the shock for you. I&#8217;ve learned a lot from the various postings Zerodog has made here. He also runs a professional suspension shop. There are also many DIY&#8217;ers out there. My efforts on this shock (and many of the modifications shown later) are inspired by Luke&#8217;s excellent posts. A big &#8220;Thank you&#8221; goes out to both Luke and Zerodog! 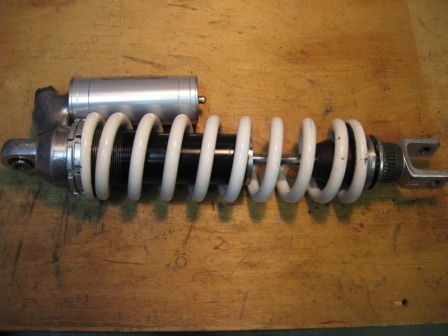 Peter Verdone Design&#8217;s (old) motorcycle shock page &#8211; shows the rebuild of a sportbike shock. A good primer to the subject. Peter Verdone Design&#8217;s Wiki (motorcycle suspension section) &#8211; contains such gems as the suspension fluid comparison chart. 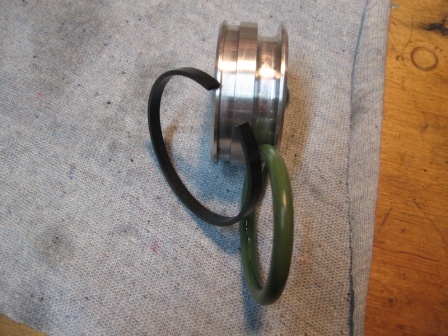 Zerodog&#8217;s original topic &#8220;Ever wonder what&#8217;s inside your 640 shock?&#8221; &#8211; also includes good general discussion and Luke&#8217;s excellent posts about DIY shock maintenance. Be sure to read all pages! 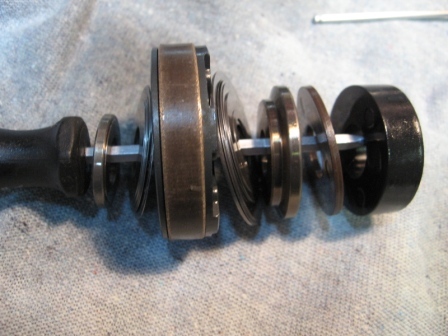 &#8220;LC4 shock rebuild parts&#8221; &#8211; a newer topic with a clear focus on DIY shock maintenance. Good discussion on wear items, alternative part sources and shock service tools. 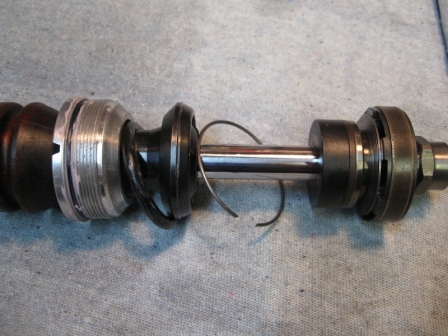 &#8220;KTM 640 Shock shims&#8221; &#8211; a good collection of real-world shimming data from various sources for the WP4681 shock. This little gem was found from the Index thread. It seems to discuss shock maintenance indicators as well as removing the shock from the bike. This thread has many shock related links, posted by Meat. 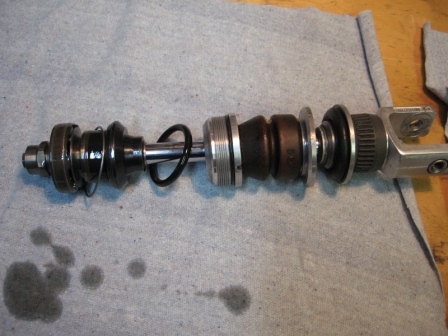 Last note before the actual rebuild content is that the method shown here requires two permanent and irreversible (short of buying new parts&#8230 modifications to the shock. Also, I will be showing quite a few special tools, many of which are home made with a lathe. Please do not be intimidated by this, I will also (try to) show an alternative method or tool to accomplish the same result. However, I consider the two modifications (piston mod and Schrader valve) mandatory for complete and successful DIY shock service. 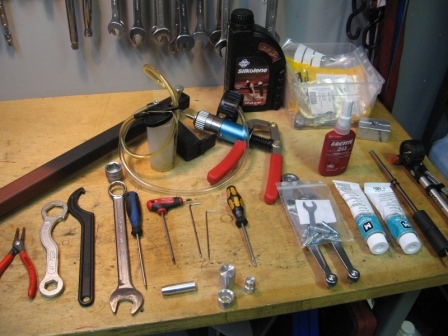 This picture shows all the necessary tools for servicing the shock. Many of these are special tools that I&#8217;ve fabricated. Many can also be improvised from common shop items, or something else can be substituted in their place. I will be describing each special tool more closely as it is encountered in the shock service. Regarding the more general hand tools, the list is as follows: small internal circlip pliers, a hook wrench (look in your KTM toolbag&#8230 , 22mm wrench and/or socket, a small flat-head screwdriver, metric allen keys (at least sizes 3 and 2.5) and a medium flat-head screwdriver. Service chemicals include loctite (medium strength &#8220;blue&#8221; 243 or 222 should be good enough), o-ring grease and suspension fluid. I assume you&#8217;ve got one of these on your workshop table. If you need help actually removing the shock, go back and read some posts linked above. Once you&#8217;ve got the shock out, go ahead and clean it externally. It is much nicer to work with a clean shock than one covered in chain grease and all the dust and mud from the last ride. &#8230;to loosen the preload collars all the way. 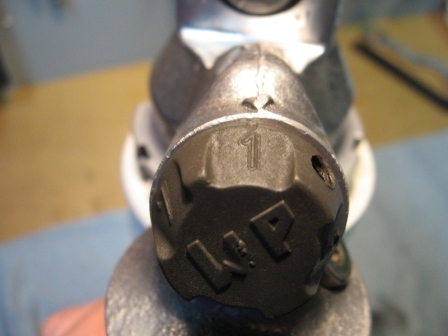 &#8230;rebound adjusters, and turn them to position &#8220;1&#8221;. I&#8217;ve built a spring compressor to help with taking the spring out. It may not even be needed in all cases, especially if you have a helper. Ratchet straps work well also for compressing the spring lightly. However, if you are able to build this type of simple spring compressor, the work is much quicker and easier. 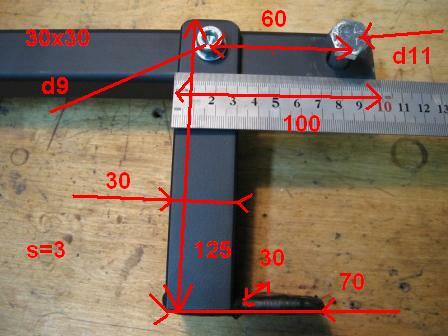 I copied the official WP special tool design, and made this version out of mild steel square tubing and flat bar. A cheap bandsaw and my trusty MIG-welder were all I needed to complete the project. 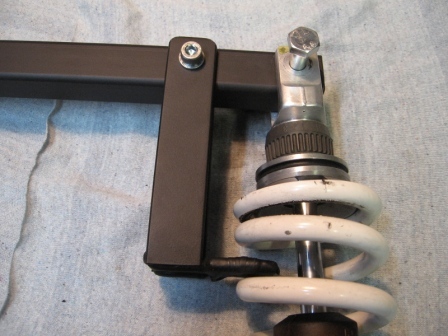 (The handle does extend quite much further than shown in the picture, leverage helps against the spring). Next, the nitrogen pressure from the shock&#8217;s piggyback reservoir needs to be relieved. 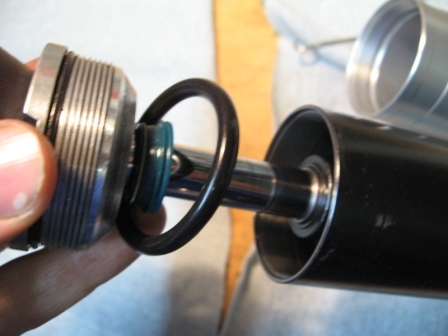 The shock has a rubber cap on the bottom of the reservoir, it can safely be pried off. Under the cap, there is a small allen head screw. Unscrew this screw slowly and carefully, listening for the escaping gas. Be careful that the screw does not go flying across the room! I&#8217;ve already installed a Schrader valve onto my reservoir endcap, in the same place where the allen head screw used to be (this is the &#8220;reservoir endcap mod&#8221 . 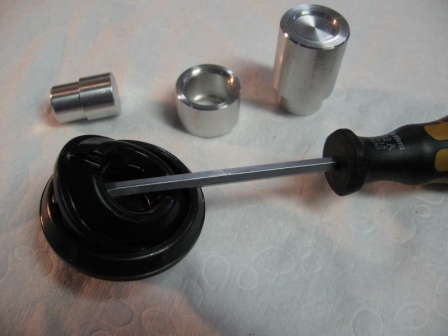 Thus, the pressure is released by unscrewing the valve cap, and pressing on the valve stem with a screwdriver. Next, the reservoir and shock body endcaps need to be loosened. 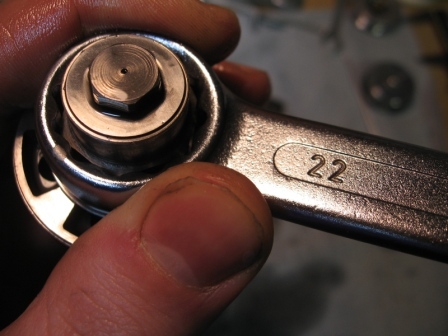 This can be done with a good, adjustable pin wrench, preferably with interchangeable pins of different diameters. I am using the Facom model 117.B pin wrench, more info here and a supplier here. &#8230;and are about 33.3mm (center to center distance) apart from each other. &#8230;and are about 37.1mm (center to center distance) apart from each other. So, go ahead and loosen both caps but only remove the reservoir endcap for now. You may need a helper to hold the shock in place, the caps can be on there tightly from the factory (loctite and such&#8230 . Please resist the temptation of just clamping the shock onto a vice (from the shock body area). The shock body tubes are quite thin and you don&#8217;t want to damage or even mar them. One option is to drill two large holes in some thick plywood or plastic, so that the reservoir and the shock body fit into these holes. That setup makes for a good shock holder while wrenching on the endcaps. Also, heating up the endcap areas with a hairdryer or a hot air gun may help, especially with loosening any loctite that may be left on the threads. 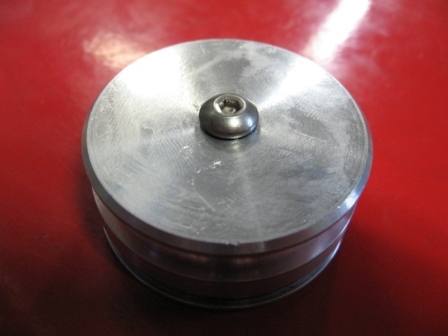 Here&#8217;s Luke&#8217;s original post about the reservoir cap modification. Now that you&#8217;ve got the reservoir cap out, this is a good place to stop to discuss the first mod for a bit. The WP shock uses a regular screw as the plug for the reservoir. Thus, filling it up with nitrogen requires a special WP filling device. 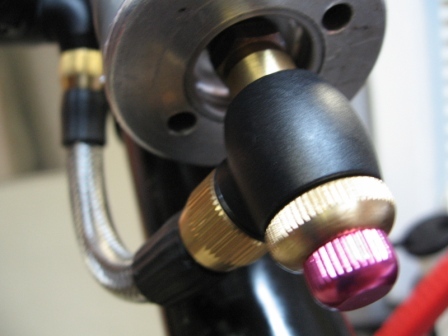 The need for this special device is eliminated by replacing the screw with a standard Schrader valve. 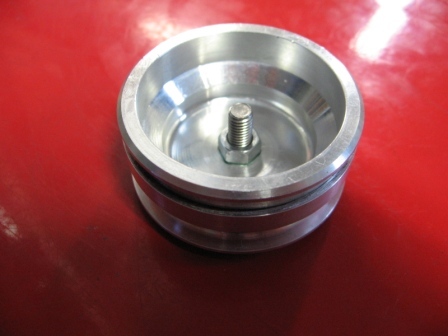 They are used in many motorcycle and MTB shocks, as well as tank fill adapters for compressed air etc. 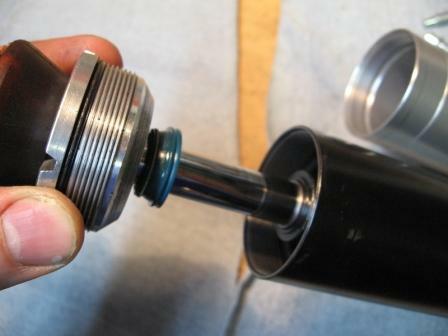 Once you have the Schrader valve installed in your cap, you can use a MTB shock pump to pressurize your shock with air, for testing purposes. Once you&#8217;ve figured out that the rebuild has been successful, you can have a shop fill the shock with nitrogen (if you so wish&#8230 . 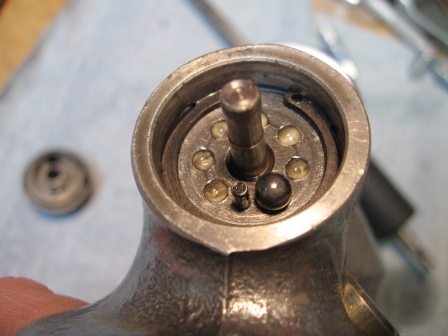 To install a Schrader valve, you need to drill and tap the cap for the appropriate threads, and then screw the valve on, with loctite to seal the threads. 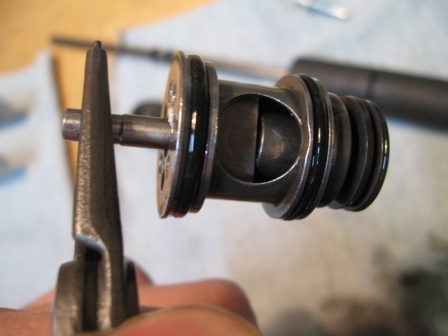 To remove the piston rod (complete), hold the shock upright and unthread the endcap completely. Slide it "upwards" on the piston rod. 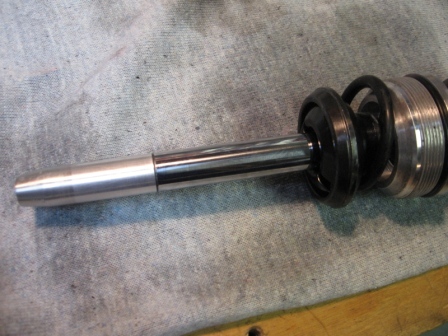 Then, slowly and carefully, pull the whole piston rod out. 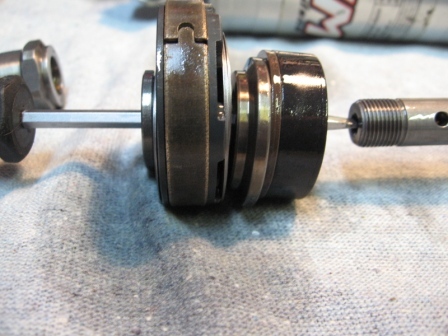 Make sure to pull the rod straight out, so that the piston or the seals won&#8217;t get caught up on anything, or scratch the shock tube from the inside. 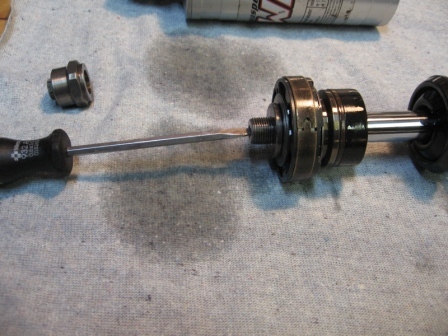 Lay the piston rod (complete) on a clean towel. 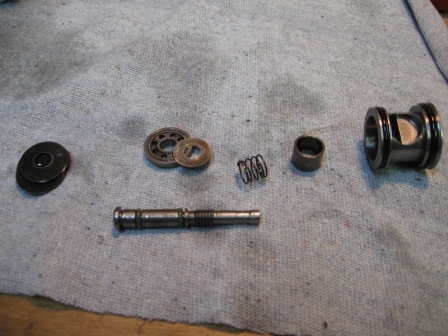 There&#8217;s a few loose components that come out with the piston rod. They are the o-ring and a metal wire clip. Don&#8217;t worry about these for now, just make sure you don&#8217;t lose the circlip. &#8230;and pour out the shock oil. 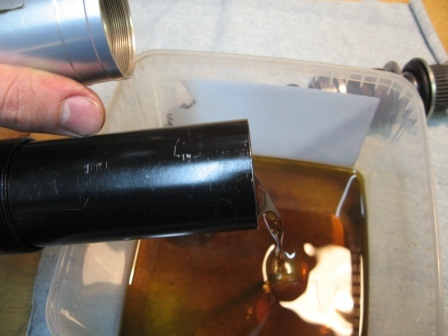 Make a note of how clean or dirty the oil is. You can use that as a rough parameter of whether the shock needs more frequent attention or if there is something more seriously wrong with the shock. 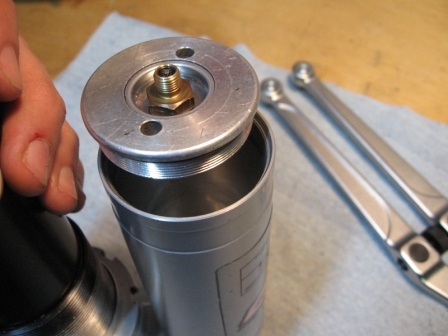 To disassemble the piston rod, you need to unscrew the bleed adjuster at the top of the piston. 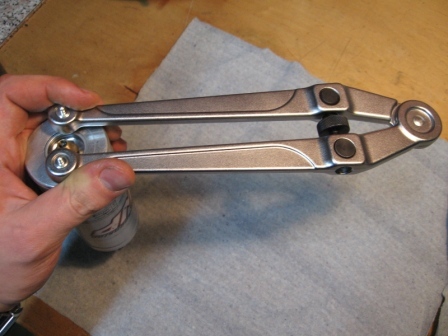 Hold the rod in a padded vice by the bottom mounting fork and use a 22mm wrench to unscrew the bleed adjuster. 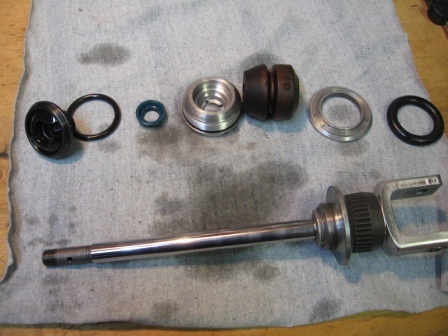 Place a thin screwdriver on top of the piston rod and remove the whole piston package, including all the shims and washers. Be careful here, don&#8217;t drop any of the shims or mess up their order or orientation. 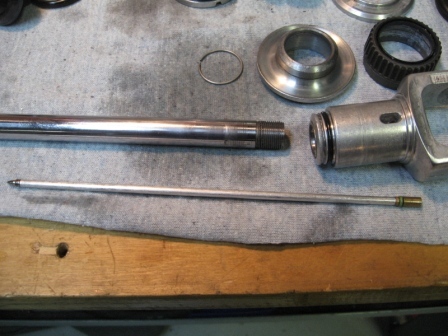 Then simply slide the remaining components off of the piston rod. The circlip (46810010 CIRCLIP 49X1,5) is not shown. 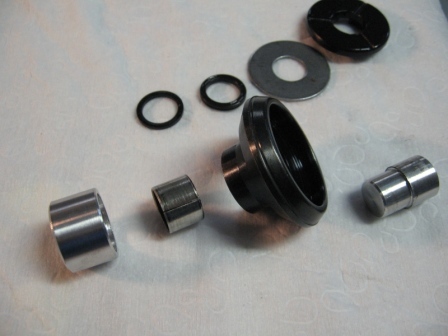 &#8230;the adjuster ring and the seals. No further disassembly is required for regular maintenance. 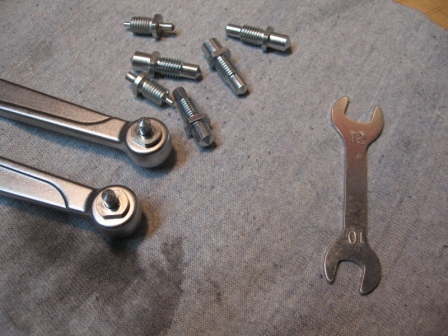 Complete disassembly (not recommended) involves a rod holder. I made one from aluminum in a lathe; the rod is quite exactly 14mm in diameter. Clamp the rod in a vise with the rod holder, heat up the mounting fork area to soften the loctite, and unscrew the mounting fork. 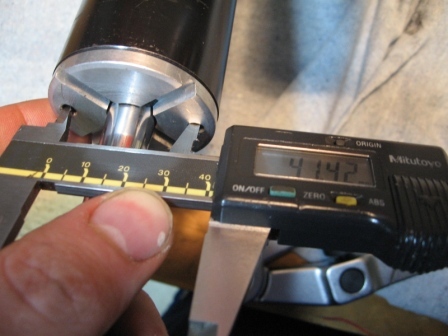 It is on there quite tightly, the holder tool needs to have a good grip on the rod. However, it must not slip and mar or scratch the rod while doing so. The adjusting needle can then be pulled out. 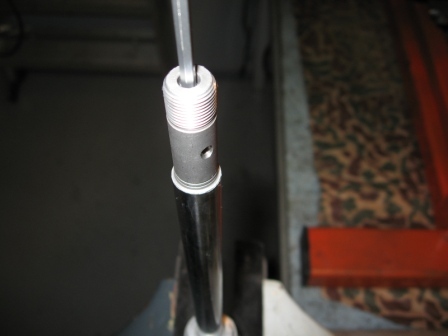 The needle seat is on the other end of the rod, it can be unscrewed with a small allen key. This same post by Luke details also the piston mod, and this post expands on the topic. If you are doing this shock service for the first time and the &#8220;piston mod&#8221; has not been done yet, you need to get creative. However, if the &#8220;piston mod&#8221; has been done already, things are much simpler. Just screw the special tool onto the piston threads pull the piston out. 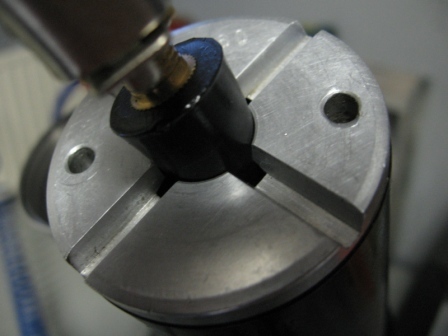 Without the piston mod, compressed air can be used to take the piston out. Take the shock body endcap, and screw it back onto the shock, hand tight. You can try to use a blowgun to force air through the cap&#8217;s hole into the shock. However, the cap&#8217;s hole is slitted in four directions, thus you won&#8217;t be able to get much pressure in. The answer is to use a rubber grommet on the hole, making a good seal. When you apply air, the reservoir piston can come flying out with quite the force. So please be careful. Point the shock to a safe direction and use a rag or something (not your fingers or face, though!) to catch the piston gently as it comes out. 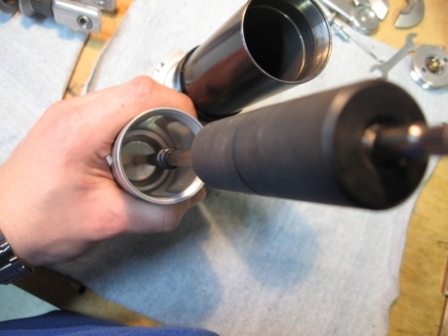 The piston mod involves drilling and tapping a small threaded hole (M5 is good) into the middle of the reservoir piston. 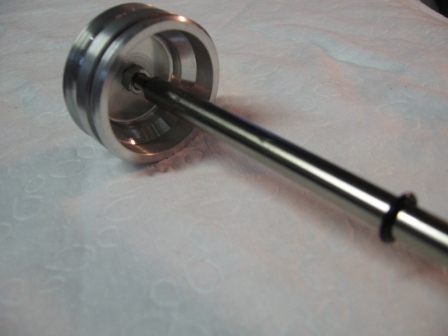 Screw a low-profile (button head) machine screw through the piston, like in the pictures, and lock it in place with a good amount of locktite and also a locknut. The threads need to seal well. 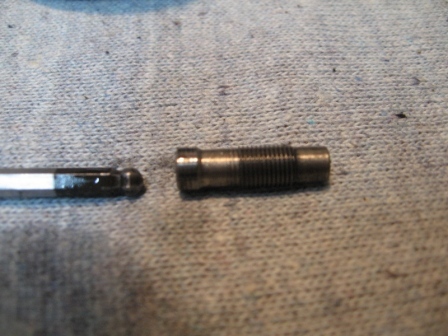 A low-profile screw head will clear the shock body casting. 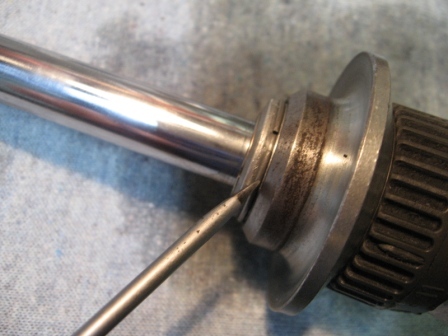 Make sure that the bare screw on the other side does not protrude over the piston&#8217;s edge. 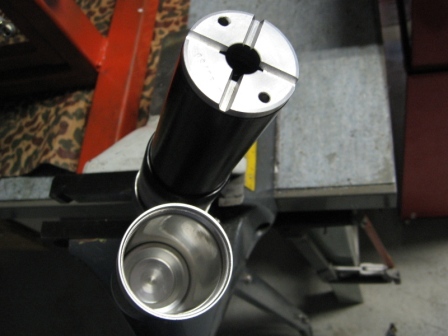 The special tool associated with this piston mod is simply a length of rod with matching (internal) threads at the end. That way, you can screw the rod onto the piston and use the rod to pull the piston out &#8211; no need to fuzz around with compressed air. 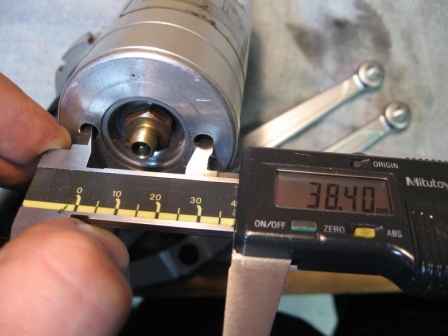 It is also useful in setting the piston height, later on. &#8230;remove the knob, spring and steel ball. Watch out for the latter two, they may go flying! The picture shows where the steel ball is supposed to go when the adjuster is in position &#8220;1&#8221;. 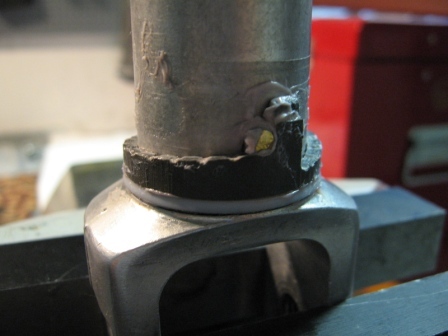 &#8230;pull the compression adjuster straight out. Drain any remaining shock fluid from the shock. KTM manuals are really vague about further disassembly of the compression adjuster. I wouldn&#8217;t recommend taking it apart either, no separate parts are available for it. The adjuster consists of the body and the adjustment rod going through it. The rod holds captive 2 pairs of Belleville springs (little curved washer looking-thingies&#8230 at the far left. Then there&#8217;s a piston-type piece, with holes drilled on it. 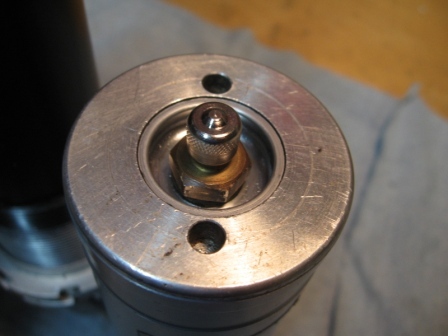 A small shim (or check-valve) rests against this piston on the other side, covering up the holes. 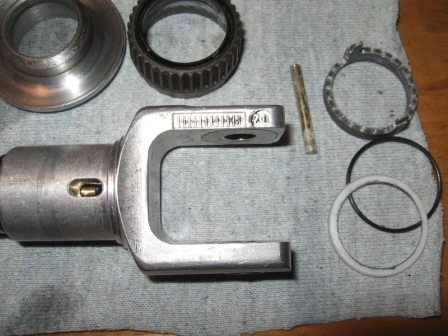 The shim is held against the piston by a spring, and a spring guide/cup is the last item on the rod. This whole package screws from the bottom up onto the compression adjuster. KTM does not sell the shock shaft seals and bushings separately. However, these are considered a wear item. One option is to buy the whole &#8220;adapter cpl.&#8221; every time the shock needs servicing. The other option is to replace only the wearing components inside the adapter. For disassembling the adapter, I made some special tools with the lathe, they are shown in the background. 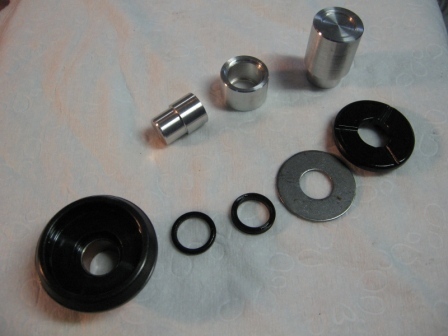 The shaft bushing is a 14mm i.d., 16mm o.d. and 12mm wide (soft) steel plain bushing with a Teflon inner surface. Equivalent INA part number is EGB1412-E40. The shaft seal is a quad-ring (an &#8221;o-ring&#8221; with a cross-section in the shape of an x), 13,95mm X 2,62mm. Buna-N material is equivalent with regular NBR. You can source these parts probably for very cheap and save a lot of money. Start by carefully prying the rubber &#8220;bumber&#8221; off of the adapter, using a thin screwdriver. Underneath, there is a big flat washer, the quad ring and a support ring. They all just lift out. You can probably see the bushing still in the adapter, it is a light press fit. 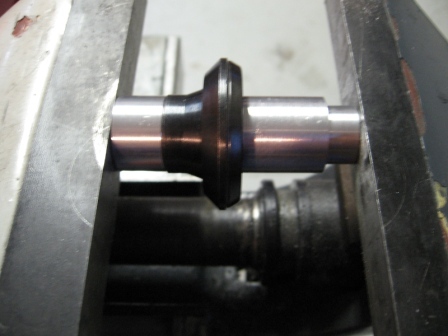 To remove the bushing, you need a driving mandrel that is just about the size of the bushing&#8217;s o.d. (16mm). As the bushing is quite thin you can&#8217;t go too small either, but you&#8217;ll probably be able to find something. 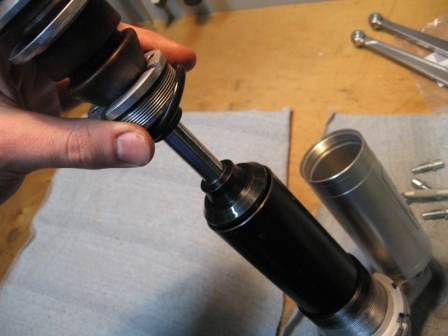 Put a larger socket or a length of pipe on the other side of the adapter and press out the old bushing with the help of a vise. 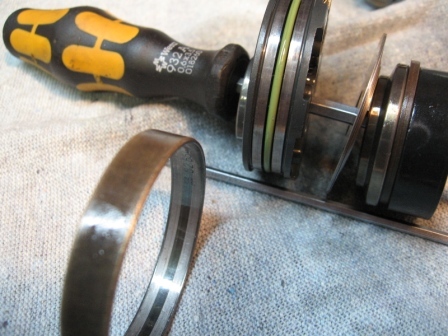 Using similar tools, press in a new bushing from the top, until it is flush with the seal pocket. 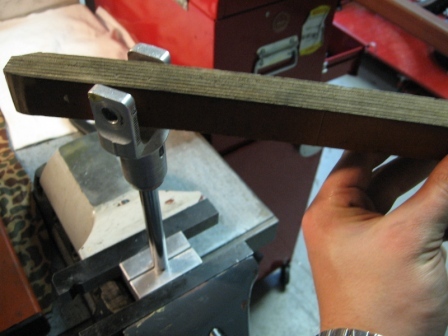 Note that the bushing will stick out a smidge from the bottom when correctly pressed in. Make sure that the socket you are using to support the adapter allows for this to happen. The rest of the reassembly is a simple matter of putting the support ring, a new quad ring, the flat washer and the rubber &#8220;bumber&#8221; back onto the top of the adapter. Make sure that the rubber is able to rotate in the holder after assembling it. 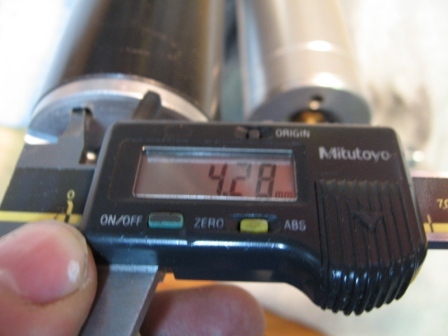 The official WP method would have included &#8220;calibrating&#8221; the new bushing with a calibrating mandrel (T149 CALIB. 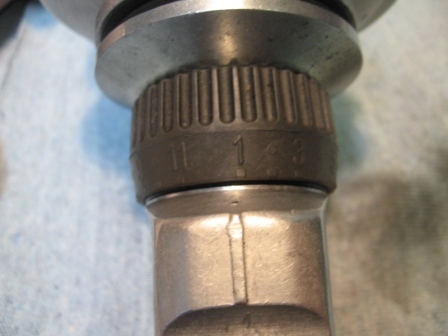 MAIN BUSHING D=14). However, the consensus seems to be that this is not necessary. and of course the dust seal (46811044 DUST SEAL 1424). 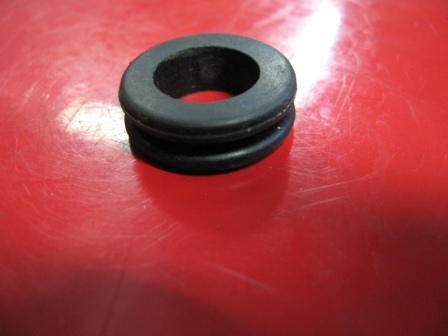 The anti-vibration ring is really just a big o-ring (46811512 O-RING NBR 32X8). It is prone to cracking. Replace if necessary. 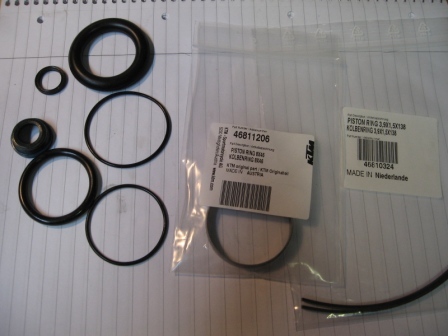 Other items that may be good to change &#8220;while you&#8217;re there&#8230;&#8221; are the reservoir and shock body endcap o-rings (46810340 O-RING NBR 45X2 and 46811042 O-RING 40,00X2,00 WP). I believe you can source most of these o-rings from industrial suppliers. 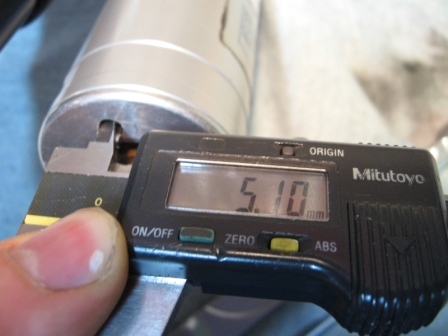 The FPM code on the piston o-rings means that they are made of Viton material. Most others are just regular NBR/Buna-N. 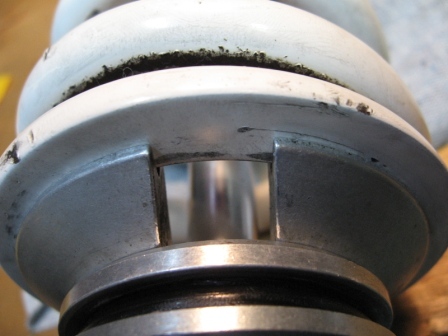 If you need to change any other seals and o-rings, note that, despite their names, the rebound adjuster knob seal (46811221 O-RING 35X3) and the adjustment ring bottom seal (46811222 O-RING 36X0,5) are not actual o-rings at all (the former is more like a lip seal, the latter looks like a thin support ring for an o-ring&#8230 . These parts should probably be sourced from KTM directly. As they say in the &#8220;best&#8221; service manuals, installation is simply the reverse of removal. 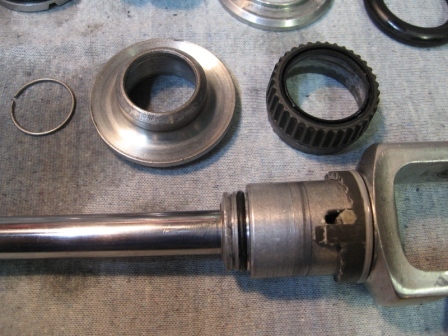 If you disassembled the piston rod completely and took out the needle and needle seat, you need to start the reassembly there. 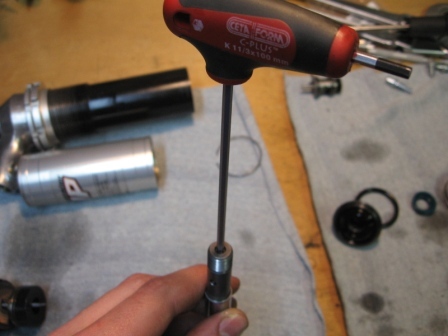 Put the needle back in, apply locktite onto the piston rod threads and screw the bottom mounting fork on tightly (use the rod holder to hold the piston rod in place). 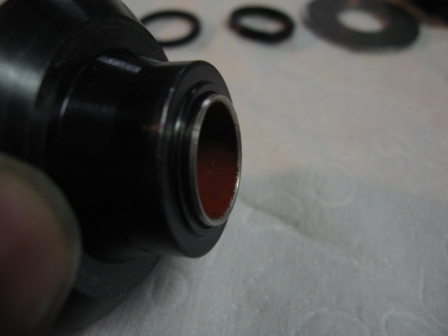 Grease and install the seals, adjuster ring and the pin (in the highest position, 11). If removed, grease the needle seat threads and screw it in until it (lightly) bottoms out on the needle, then back up 2 turns. 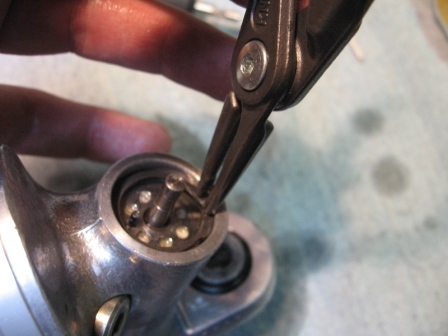 Then turn the adjuster ring back to position &#8220;1&#8221; and use a thin allen key to push the needle down from the top. 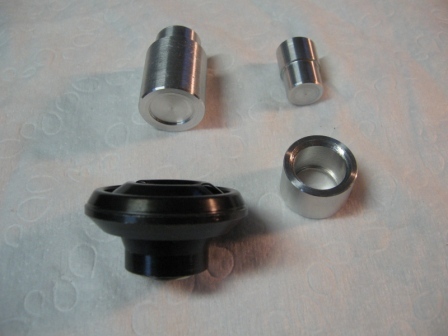 &#8230;a &#8220;seal bullet&#8221; should be used for installing the dust seal and the previously serviced &#8220;adapter cpl.&#8221;. The seal bullets should be available from suspension specialty shops. I made a seal bullet out of aluminum: the straight section is about 35mm long and very close to 14mm in diameter. All through the straight section is a hole 12mm in diameter and the end of the seal bullet has a slight taper to help in getting the seals onto the shaft without tearing them. 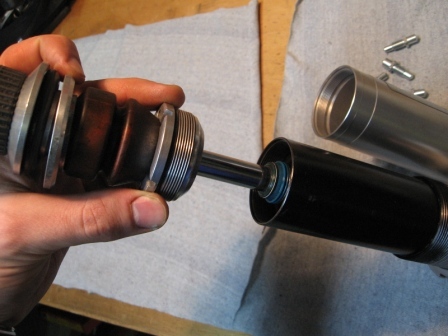 This post by Luke discusses alternative assembly options, if a seal bullet is not available. Then slide the whole piston and shim package (in order) from the screwdriver onto the shaft and mount the bleed adjuster nut. Torque the nut to 40Nm. 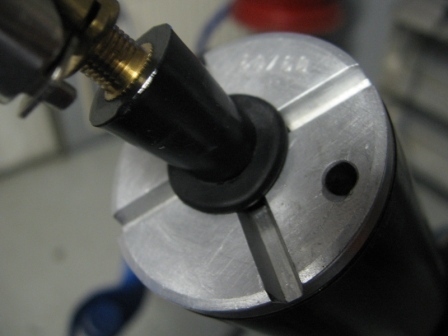 Install the circlip onto the shaft in its correct place. Verify also that you have all the components on where they are supposed to be. Note the o-ring, which will seal between the endcap and the &#8220;adapter cpl.&#8221;. 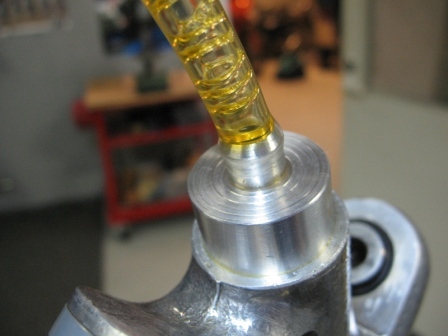 In preparation for the shock filling, the compression adjuster needs to be (temporarily) installed with its circlip. Note how the hole faces the mark while installing. I think it is also best to install the reservoir piston at this stage, pushing it all the way against the shock body casting. Please install the piston carefully; you don&#8217;t want to damage the seals. Pour suspension fluid into the shock body, &#8220;about halfway full&#8221;. 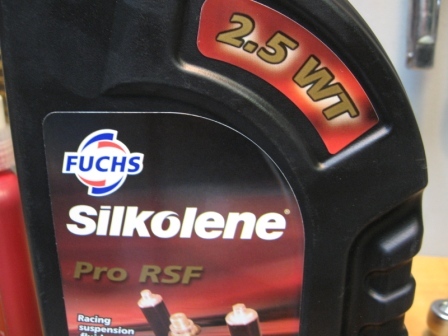 Silkolene Pro RFS 2.5WT is the choice of champions!. 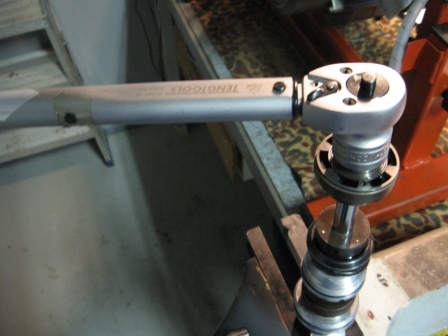 Hold the other components on the piston rod back and slowly and carefully place the whole piston rod package into the shock body. Once you have the piston some ways in, you can install the important circlip. There&#8217;s a small ledge after the threads, against which the circlip should fit. Make sure it is seated properly. 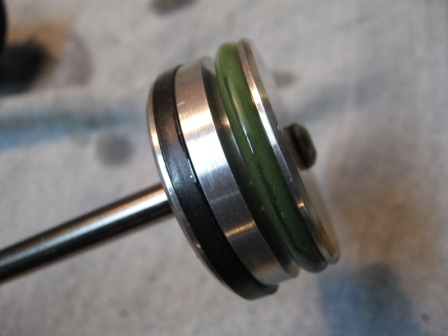 Then push the whole piston rod slowly down and thread the endcap on. Snug it up lightly with the pin wrench. 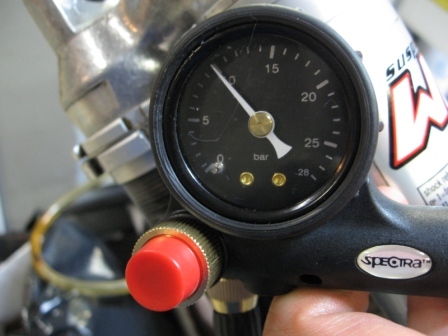 Here&#8217;s Luke&#8217;s original post about bleeding and pressurizing the shock. The &#8220;old&#8221; official WP method of bleeding the shock involves just a simple bleed bottle. It relies simply on the tendency of air bubbles to rise to the top. 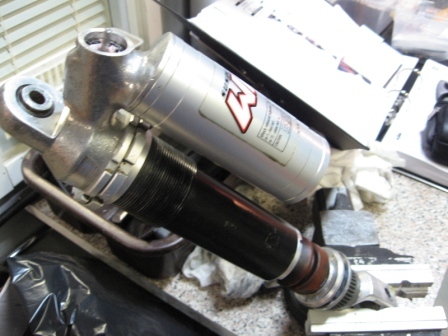 However, current shock service methods usually involve a vacuum pump of some sort. It is easier to get all the air out from the shock with vacuum assistance. I decided to try homebrew vacuum bleeding as well. First I made this kind of adapter piece. It has a hose barb on the other end for the vacuum connection. The other end fits into the compression adjuster bore and it seals well with a small o-ring. Similar setups can be made from a rubber stopper (cork) and a hose barb. 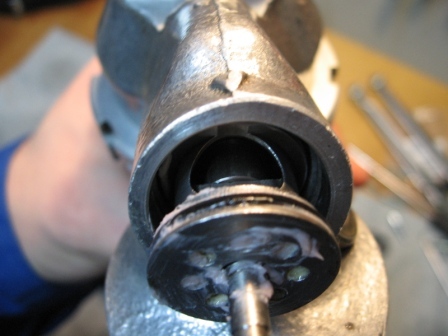 Even if you are not planning to do vacuum bleeding, you should figure out some (leak-free) way of attaching a hose onto the compression control bore. My vacuum bleeding apparatus consists of a cheap Mityvac-knockoff. The adapter piece is attached to a fluid reservoir (it has a hose to the bottom to draw only suspension fluid). The other side connector on the reservoir is hooked to the vacuum pump. When vacuum is formed by the pump, fluid and air will be drawn out from the shock. Once the vacuum is released, only oil will flow back into the shock. 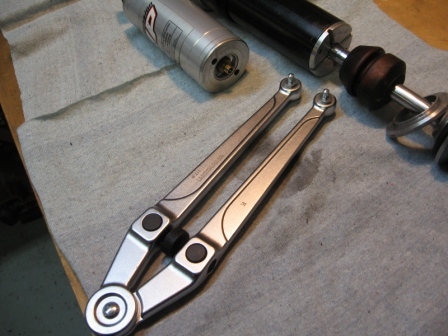 Clamp the shock so that the compression control mechanism is pointed up and that it is the highest point on the shock body. Then remove the circlip and the adjuster and place the adapter piece onto the bore. 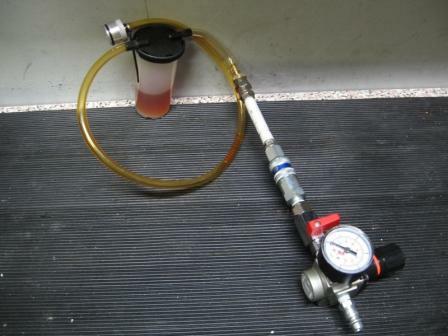 Hold the bleed apparatus and hoses so that the air bubbles have a chance to rise up and the oil can flow in. 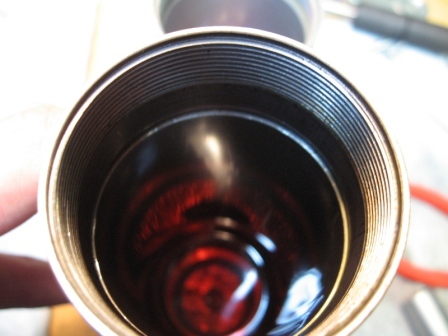 If you are not using a vacuum system, the other end of the hose should go to a &#8220;bleed bottle&#8221; &#8211; for example a soda bottle that you have equipped with a hose barb. 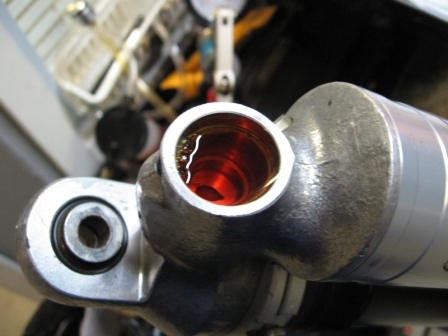 Hold the bleed bottle above the shock so that oil can flow into the shock and work parts of the shock (piston rod, reservoir piston) back and forth, until all the air is bled out. I estimate that one shock will take about 300ml total of shock fluid, including both the initial fill and then the vacuum bleed. The vacuum system works similarly. 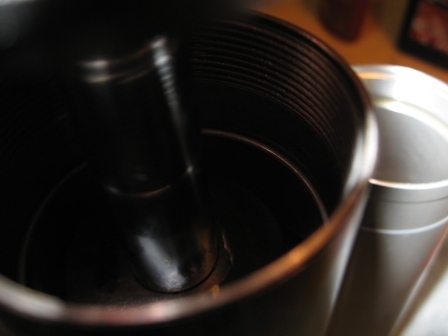 As the shock fills, make sure that the vacuum reservoir always has enough oil in it, so that you don&#8217;t end up drawing air back into the shock. 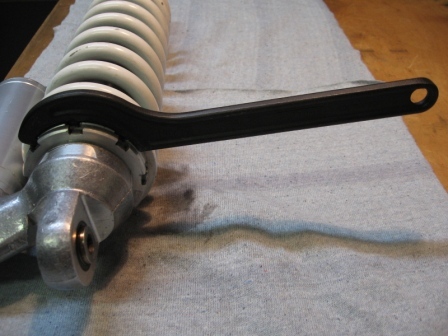 With vacuum bleeding, moving the shock parts around also helps the bleed process. 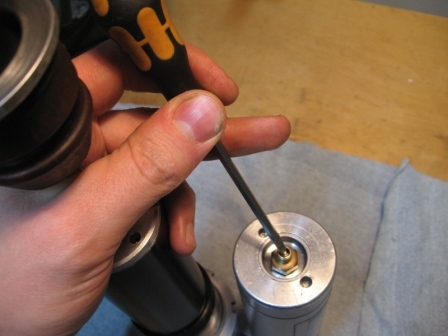 Once no more air bubbles come out, extend the piston shaft all the way. 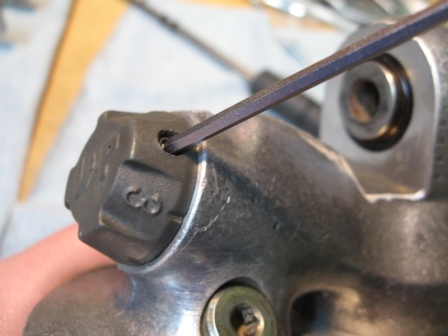 Then use the reservoir piston special tool to set the piston height to 10-15mm from the shock body casting. 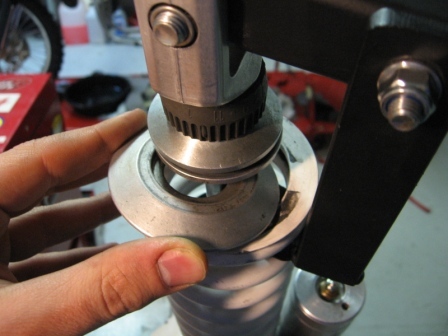 Remove any vacuum or pressure and carefully remove the adaptor piece from the shock. Install the compression adjuster back into the shock body; it should &#8220;self bleed&#8221; by displacing some oil when installing it. Don&#8217;t forget the circlip. Also install the steel ball, spring and adjustment knob, tighten the small setscrew to hold the knob in place. Screw the reservoir endcap back on and snug it up with the pin wrench. 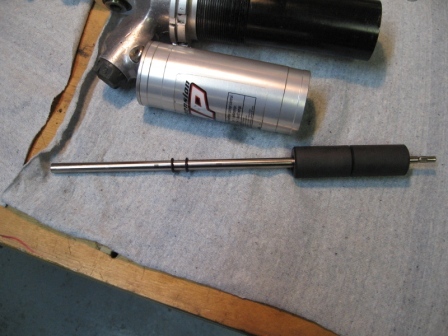 I use a MTB shock pump to pressurize the shock via the Schrader valve. Fill pressure is 10bar or about 150psi. Once you have figured out that the shock works nicely, you can have it filled with nitrogen, if you want. In addition to suspension shops, some car tire places may be able to fill your shock with nitrogen. 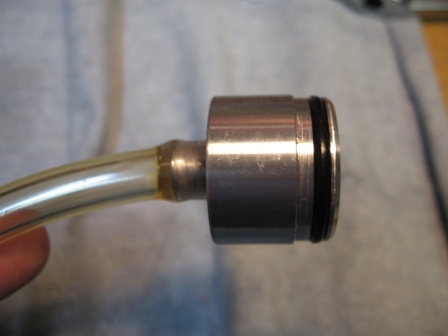 Once done, put the cap back onto the Schrader valve. 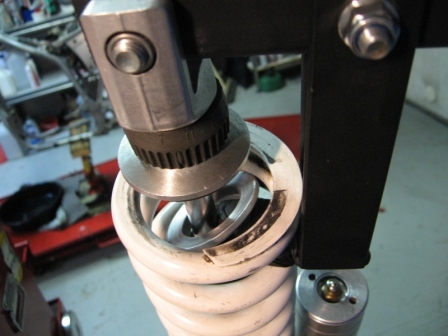 Then install the shock spring back on, with the help of the shock spring compressor. Note that the open section of the spring clip should face a &#8220;closed&#8221; portion of the spring. Set the shock spring preload back to the original setting with the hook wrench and position the compression and rebound adjusters knobs. Congrats! That&#8217;s it. Now mount the shock and go enjoy a nice ride! P.S. This is version 1.1 of this shock rebuild post. Changes to the first version include editing of spelling and punctuation errors, some formatting and adding information about the pin wrench. If you notice any errors, omissions or have any content, links or such that you think should be included, please post here and I will then edit this post. Feedback is also appreciated! Thanks. The dimensions are rough and approximate, in millimeters. None of the dimensions are really critical. The thickness for all parts is 3mm. The handle part is 30x30 tubing. At the far right, is a clearance hole (diameter about 11mm) for a M10 bolt. The pivot point has a clearance hole (diameter about 9mm) for a M8 bolt. The center-to-center distance of these holes is about 60mm. The upright supports (on both sides of the handle) are 30mm wide flat steel strip, about 125mm in length. Between these supports is welded a 70mm long piece of the same steel strip. 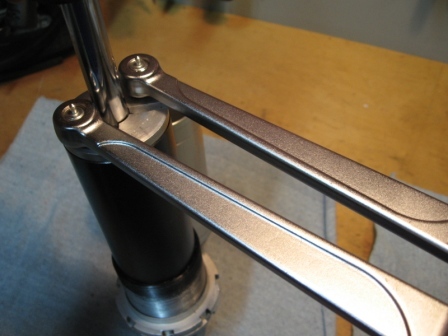 The "pressing foot" pivots around the top bolt. There are small washers also between the upright supports and the square tubing. The M10 bolt will fit through the shock absorber bottom mounting hole and thread onto it. Those Finland winters are to our benefit, nice write up... What's the next thing for you to tackle? That's an awesome write-up Tseta, thanks for taking to time to document everything so neatly! Incredible thread, thanks so much for your efforts (and props to Luke also). I'm still seeing one bad pic, right after "Then, slowly and carefully, pull the whole piston rod out. Make sure to pull the rod straight out ..."
Any chance of some pics and measurements for the spring compressor tool you made. I'll have to go look for a good adjustible pin wrench like yours. Wow, nice write up Tseta! 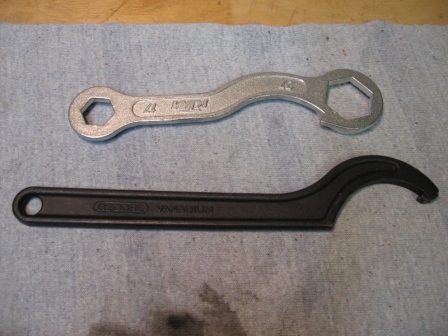 An inexpensive pin wrench can be made from a 12 inch crescent wrench with holes drilled and pins set into the jaws. The wheel travel can be varied by the different spacers inside the shock, 6mm seems about the limit, a 3 mm spacer allows the wheel to drop enough to upset the balance of the bike, negate use of the centre stand and the chain runs on the lower chain roller at full extension. Ok, I fixed (hopefully) the last pic and made some other small formatting etc. edits. I have this pin wrench. It was quite expensive, but it works really well. This is "the index" material, same as some other Tseta's threads. Yes, index for sure. This is great. Thanks for all the positive comments. Maybe this thread will make it to the index.. I wish somebody will be inspired to do the shock service by themselves. Hopefully we will be hearing many success stories of shocks refreshed and money saved! Gunner, I guess cabin fever is starting to set in. I've now received the parts for my bike, so I can continue the rebuild. Soon I'll be able to put those spikes to good use again. "I wish somebody will be inspired to do the shock service by themselves. Hopefully we will be hearing many success stories of shocks refreshed and money saved! " I have rebuilt/revalved my ATK's WP rear shock many times over the years while pursuing elusive perfection; although I'm darn close right now! I can't imagine how much time you spent on this project. During my brief scan of the write-up I was impressed by the clarity of the photos and the well written descriptions. Your article may have come at just the right time for me. Do you know where to source WP springs (in the U.S.) that don't cost $200 each (Factory Connection)? It seems that WP springs are a slightly smaller diameter than the excellent springs I have sourced in the past (Eibach and Hyperco). My ATK has limited space and the high rate springs I am arriving at are too fat to fit because they hit chassis parts. My location is far north on the old continent, so unfortunately I have no leads on US spring suppliers. I bought a genuine WP replacement spring for my shock to carry the weight better. Cannon Racecraft. Inmate Zerodog can get them very reasonably priced, even the custom rates. "Erkmania, thanks for your positive comments. However, I think this thread gives off the (very) wrong impression that I'm even somehow knowledgeable with suspension..."
You deserved the commentary for your thorough dissection. And, I'm sure you know WAY more than most about suspension. As for WP springs, I kinda figured I was grasping for info you didn't possess regarding the New World. Thanks, LukasM. That's a REAL help. I found a way to make the vacuum bleeding easier, provided that you have access to compressed air. The back story is that the cheap mityvac knock-off did not work very well straight from the beginning. It would not produce a very strong vacuum and pumping the handle was quite tiresome. 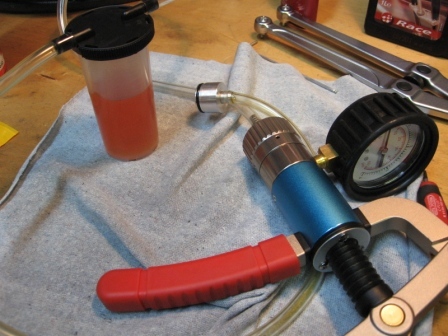 "Official" vacuum bleeding methods employ an electric vacuum pump, but these are hard to come by or prohibitively expensive. These are simple, ejector-based, inline vacuum generators. So, a pressure regulator (which I already had from the leak-down tester...), and a few fittings later, I now have a functional, compressor-powered vacuum source. The ejector itself cost maybe less than 20 euros, not too bad IMHO. I tested this setup today and it worked very well. The bleeding procedure is still the same as with the manual pump, only I don't have to fatigue my hands with pumping the vacuum over and over again. I also think I got more of the air out in a shorter amount of time. This is at the top of the list for sure! I really need to do some maintenance to those posts... been a LONG time. I missed this one Tseta - not that I'm about to tackle the shock (the forks have been challenging enough, and I haven't even done the seals yet). But others may be for sure - and the index may help them find your thread. Good job compiling links - I appreciate that most of all - more info is not a problem for me as long as its organized like this.